Camfil will be exhibiting at the Energy & Environment Expo on 17th-19th June on Stand O1700 in the Energy Hall at ExCeL, London. Award Winning Hi-Flo M-Series – which incorporate high-lofted air-laid micro-fibre glass media to ensure reliable efficiency over the entire lifetime of the filters. Compact Filters – high efficiency filters which provide a range of benefits including improved indoor air quality, lower running costs for AC units and demonstrable energy savings. 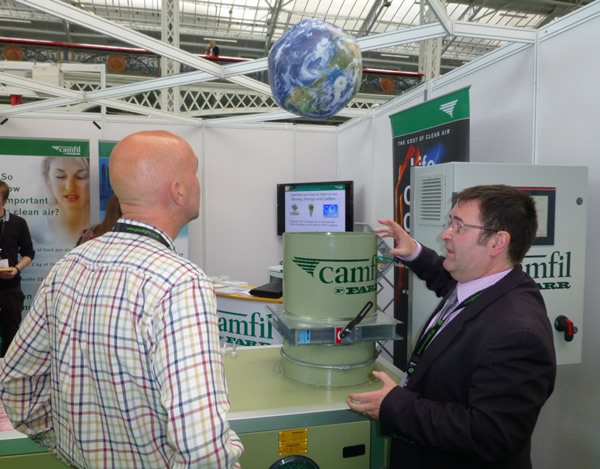 We will also have an Air Handling Unit (AHU) demo machine on the stand to provide a real life demonstration of air filter performance and energy saving benefits is a good way of showcasing Camfil’s Low Energy Air Filters.